Description: A clear plastic cup that can hold 16oz. A typical small-medium sized beverage. Can be used with a plastic lid. Description: A clear plastic cup that can hold 22oz. A typical medium-large sized beverage. Can be used with a plastic lid. 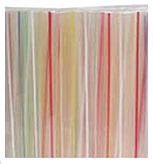 Description: Used for covering plastic cups. 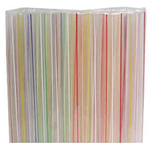 Description: Large diameter straws used for beverages that contain toppings and sinkers. Examples of which are tapioca pearls and tapioca noodles. Comes in striped multi colored variants. Description: Your normal sized straw for pure liquid beverages. Comes in striped multi colored variants. Description: Used for holding plastic cups for customers who decide to take out or for delivery items.